Whether the space is inside or outside, sometimes living areas need an update. A living room may need a new coat of paint, a kitchen may need a new counter and a deck may need to be resealed. When it comes to decks, however, they do need to be replaced periodically (the typical deck lasts 10 years). 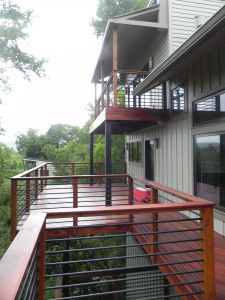 This deck replacement project in Austin is a great example of how an old deck can be replaced to make a big visual impact. This multi-level deck and large staircase had been better days. While the design and layout of the space worked well for the homeowners, the wood was warping and splitting. 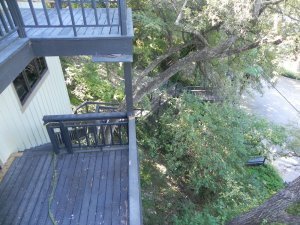 Deck safety is always a concern for older decks, but injuries can be more serious if the deck is set high off the ground like this one. When looking at material for their deck replacement, the homeowners wanted to make it more visually appealing and to bring some color into the space. The current deck was done in a pressure treated wood that had dried out, weathered and greyed over time . The modern house needed a deck to match! In looking at different wood and composite decking options, Archadeck of Austin recommended tigerwood decking for its strength and color. Tigerwood is an exotic hardwood gaining popularity in the US decking market. It naturally repels insects, fungus, and rot so it doesn’t have to be treated with additional chemicals. 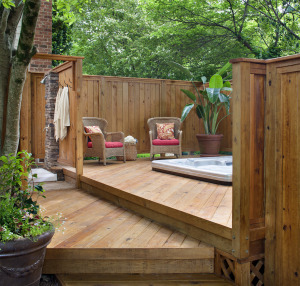 The lifespan of Tigerwood is longer than pressure treated wood meaning a deck doesn’t have to be replaced as often. It does however, need to be treated with deck oil periodically. The color of Tigerwood, as you can see, is gorgeous. The deep reds and oranges are highlighted with streaks of brown making it visually appealing. It may not be an option for homeowners that want a solid consistent color, but on a modern home in a wooded setting like this, it’s a stunner. Archadeck of Austin finished the space with horizontal iron railings to provide the necessary safety, but it doesn’t compete with the Tigerwood at all. If you have questions on deck replacement or different decking options in your area, please contact your local Archadeck Outdoor Living office. This summer has truly flown by. It’s hard to accept that football is now on TV and kids are going back to school. As I look forward to autumn, I’m excited to spend time outdoors with friends and family. One feature that makes it more comfortable: an outdoor fireplace. 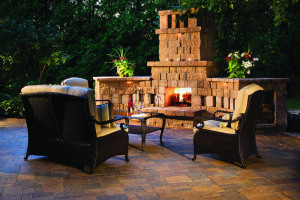 Fire features are a growing trend in the outdoor living category. Whether you have a fire pit or an outdoor fireplace, they often become the centerpiece of any outdoor living space; the perfect spot to sit and enjoy friends and family. When it comes to outdoor fireplaces, the perfect one can be designed and built just for you. 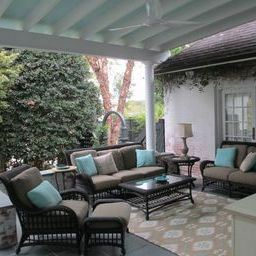 At Archadeck Outdoor Living, we design and build custom outdoor living structures for our clients. Each homeowner has different needs and tastes and we create spaces around their preferences. An outdoor fireplace is no different; just take a look at these unique structures to get an idea. 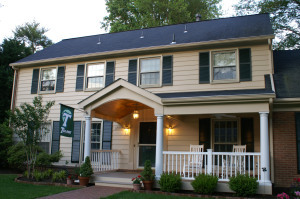 Some homeowners enjoy a traditional or classic style. This first outdoor fireplace sits within a screened porch and complements the classic finishes of the entire room. A clean red brick was used as the primary material to go with the crisp white trim and finishes. To bring extra attention to the piece, traditional sconces and wood mantle were added to the fireplace. This large wood burning outdoor fireplace has a completely different look and feel than the first example. It anchors the patio that it is a part of. Instead of traditional brick, it’s made out of a neutral, natural stone. High mantles on either side were designed to define the space and make it feel like a true room that just happens to be outside. The sides also act as storage for the firewood for the piece. I love the rustic earthy feel of this fireplace. This last example comes from our deck builder in Charlotte, NC. 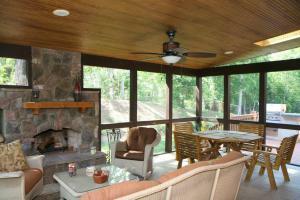 Their screened in porch includes a lot of earth tones and natural wood on the ceiling. A red brick just wouldn’t fit the overall design of the space. Instead a stone outdoor fireplace was designed with a wood mantle to complement the ceiling of the porch. Doesn’t it look like a cozy place to curl up? Outdoor fireplaces not only allow you to use your outdoor spaces longer into the season, but are also a great design statement. From stone and brick to gas vs. wood burning options, Archadeck Outdoor Living will design the perfect fireplace for you. Be it a deck, porch or patio, many homes have some types of outdoor structure in the backyard. But just because you have a structure doesn’t mean you have an outdoor living space. An outdoor living space is place where people go to spend time, but it requires at least one of these attributes. Function. To be a room that’s used, whether indoor or outdoor, it needs to have a function or purpose. Otherwise, it’s a wasted space. Homeowners are all different and use their outdoor spaces for different purposes. For some, they need a space to entertain friends and family, others want a place to cook, or maybe they just want a cozy space to read a book. Function leads to the second attribute for an outdoor living space: design. 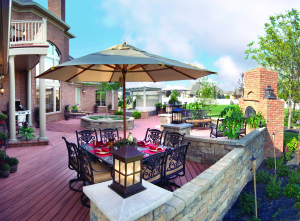 At Archadeck Outdoor Living we pride ourselves on our patio and deck design. When the perfect outdoor space is created, it will invite the owners, friends and family outside and they aren’t all the same. The space created for the homeowner who enjoys cooking outdoors and entertaining friends and family needs a different space than the person who wants to sit and read a book. A great design will create a nice flow and define the areas of the structure. The last attribute that makes a deck, porch, or patio a true outdoor living space is furniture or at least a place to sit. People will only go out and stand in an empty space for so long before looking for a place to sit. The furniture that’s added to an outdoor space should reflect its function and design. For instance, if you like to eat and dine outside, you may need a table and chairs, while a built-in bench may be enough for a space that’s just used for happy hours. A professional deck designer and builder will help you to create an outdoor room that you’ll use. To ensure you get the best space possible, be clear on how and when you expect to use it. For questions or to speak with a deck designer about your outdoor space, please contact your local Archadeck Outdoor Living office. Considering a New Wood Deck? Go for it! When it comes to large financial decisions, you want to feel good about your purchases. From cars to renovations, if you are like me, you weigh the benefits of moving forward with the investment now or waiting. If a new wood deck is on your list of renovations, rest assured, you’ll not only get more living space, but you’ll be adding value to your home. Whether it’s adding a new bathroom, updating a kitchen or adding a deck to your backyard, return on investment should be part of your evaluation project. Will it add value to the home? A Remodeling Magazines Cost Vs. Value report ranks wood decks as the second highest Return On Invest project in the midrange cost (a new entry door was number one). According to the report, when homeowners add a wood deck to their property, they can expect to recoup, on average, 87.4% of the cost, adding value to your home. Decks are great and easy way to increase the usable space on your property. Working with a professional and experienced deck builder, homeowners can have a space designed and built specifically for their needs. It can be as small or as large as you want, but deck design is important. If it isn’t designed properly and doesn’t fit how you intend to use it, you won’t. Make sure you are very clear with how you intend to use your new deck, be it cooking, entertaining, reading, etc. so you get the backyard of your dreams! Over the last several years, we at Archadeck Outdoor Living have seen the composite decking category boom. Don’t get us wrong, composite is a great option for decking, but wood is still a viable and cost-effective option. Pressure-treated wood is getting better too, with new eco-friendly options. Sometime the look of wood can’t be beat. For the homeowner that enjoys the knots and grain, pressure-treated wood is your best option for decking material. It can be stained in a variety of different colors to complement the finishes of your home, but you’ll still see the detail. If you have questions on designing or building wood decks, please reach out to your local Archadeck Outdoor Living office. August marks National Curb Appeal Month which focuses on helping homeowners add value and design appeal to their home’s exterior. Do you have plans to increase the looks of your home? Update the walkway. Friends and family enter your property and home often times via a walkway or sidewalk. Make sure that the edges are clean and the surrounding landscaping is well groomed. You may consider adding some flowers or plants along the edges if it makes sense. If your walkway is old, cracking or uneven, you may consider having it replaced. At Archadeck, we design and install beautiful paver walkways to guide visitors to the front of the home. Pop the front of the home with color. Splashes of color can make a home look more fun and inviting. Color can be added to the front of the home can be done in a variety of ways. If you want something more permanent, you can paint your front door your favorite color. If you want something that can be easily changed over time, consider adding bright planters around the door or fun outdoor pillows on any furniture you have on your front porch. Flowers are also a great way quickly add more color to your property. Update your front porch. 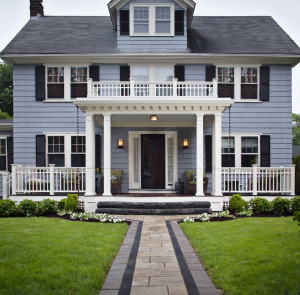 A front porch or portico can make a great first impression when done well. 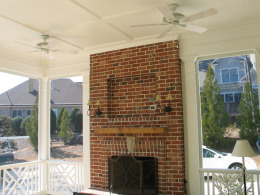 At Archadeck Outdoor Living, we design and build front porches that fit the existing home. Whether it’s a porch that runs the width of the home, or a small portico to provide some cover for guests, a great front porch can add value and curb appeal to your home. Add some unique finishes. The exterior of your home not only shows off your property, but also your personality. Look for ways to highlight who you are in your design. For instance, choose house numbers that have a fun or different design. Or, add some fun outdoor furniture to your front porch or patio. Adding curb appeal can be as complicated as you want it to be. Both the large projects, like a new porch, or small ones like adding some flowers here and there, will make an impact.